A tropical and romantic place where the sea meets the sky and blur into one! A water-repellant bronzer and face blush in one that is perfect to get that light, glowing, sculpted or sun-kissed look everyone wants for this summer. Fab new eye colors that give you a real sense of movement of the waves. I can't swatch and see what color pay-off that color combination gives. 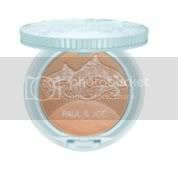 Get an instant shimmery shade of the sea eye color with this product. 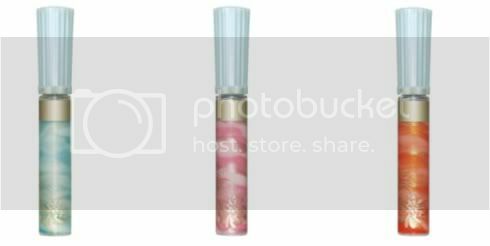 Two textures included to give you the right glossiness you want: the jelly base gives you a shimmer of sparkling pearl and clear color while the watery base gives pearly, wet texture and metallic color. By mixing these 2 colors, you can get that beautiful 3D gradient eyes. 3 stunning sea shades available. Each has a tri-color harmony with shimmering blue pearl that expresses the ocean's tranquility as it reflects the color of the sky and changes color with it. This will be available at the Paul & Joe counter at Rustan's Makati next week. If you're interested, call 899-9331 first to see if the product you want is already available. I'm curious 'bout the lip gloss b.